The November midterm election results give me hope that the pushback against hatred is gaining ground. But, the undeniable truth is that we live in troubling times and there’s still much to be done. Consider the following. On Saturday, Oct 27, 2018 an anti-Semitic terrorist stepped into the Tree of Life Congregation Synagogue in Pittsburgh armed with an automatic rifle and multiple handguns. He then murdered 11 people and wounded 6 others, all of whom were gathered for worship. In a country where words like Pulse, 9-11, Oklahoma City, and Charleston Emanuel AME are etched into dark and tearful places in our minds, why does this latest atrocity stand out? It’s the antisemitism. It’s the hate-filled killing of innocent people, several old enough to have already witnessed and experienced more than enough suffering for a single lifetime. It’s the attack on people in a holy place in the very act of worship. It’s the terrorist’s bigotry that he twisted into a rage over the work of the Hebrew Immigrant Aid Society (HIAS) and their efforts to help people fleeing danger and persecution. It’s not the first hate crime, and it won’t be the last. But, for me it was the last straw for that particular week—one already marked by other acts of violence and remembered violence. There are undoubtedly mental health considerations in all of these cases. I just can’t accept that humans are born to hate and kill one another. So, while I’ve been mulling that over, wondering how to forgive and how to have hope, I’ve been thinking about other things. Since the attack I’ve taken the time to learn a bit more about HIAS, their history, and their work. You can read about the organization on their website at https://www.hias.org, or you can visit Charity Navigator (https://www.charitynavigator.org/index.cfm?bay=search.summary&orgid=3820). For now, I can think of no better response to these killings than to do good in the face of evil, and to do it in a way that’s diametrically opposed to the supposed object of the terrorist’s rage. That’s why I’m donating to HIAS, and I want your help. Here’s how. I’m offering 8 wearable art scarves for sale and donating 100% of the sale price to HIAS. Each of these lightweight cotton scarves features affirmative words appropriate for our present situation, and patterning reminiscent of…well let’s just say “past times of protest” and leave it at that. Let’s work together to push back against the darkness and send a positive message and good energy out into the world draped around your neck. Click the SHOP button in the menu above to visit my online store and select “HIAS Fundraiser” from the lefthand column. When I say 100%, I mean 100%. I will absorb all of the credit card processing fees and material/labor costs. All I ask is that you pay the sales tax and shipping costs. So, purchasing a $60 item results in a $60 contribution from me to HIAS. I’m not operating a 501(c)(3) charitable organization, so yes, you do need to pay sales tax on this purchase; and no, I cannot provide a gift letter for your income tax preparer. In order to give everyone equal access and make this truly a first-come-first-served kind of thing, all purchases must be made by credit card through my online store. If you live locally and would like to arrange to pick up your scarf at my studio, go ahead and complete the purchase online and use the code HIASFUNDRAISER during checkout. This will apply a $7 discount to your order, thereby reversing the shipping charge. You must then contact me to arrange a pickup time ASAP. Let’s say you have a wonderful saw that cuts perfectly. Maybe it’s one of those beautiful, precise Japanese ryobas. If you spend all of your time sawing things and never take time out to clean and sharpen it, the saw will gradually become rusty and dull, and eventually useless. So too with humans—and I’m going to go further and say artists in particular. We all need to allow time for rejuvenation, growth, learning, and connection with both other people and nature. This week I had some of all of those things at the Crow Timber Frame Barn in Baltimore, OH. The Barn is a study center for art quilting and other related media and methods (e.g., textile surface design, dye methods, and foundational art skills like 2D design and color theory). I’ve been here many times over the last decade, and it’s become a touch point in my life for learning and renewal. It’s that way for many people. and it’s evolved into a sort of community. Coming back is a little like a family reunion. This week I had the wonderful experience of participating in an intense 5-day painting and collage workshop with Deborah Griffing. We drew, painted, screen printed, and collaged; we experimented with new materials, and I got some hands-on experience with oil-based media. It was fantastic. The things that I created are all workshop exercises, but they’re exciting nonetheless. Everything is a departure from the way that I’m currently working and from the marks I’m currently producing. I’m taking home new experiences and new ideas, but it all needs to simmer around in my head for awhile before I can really see if or how it will change my work. But—and it’s a big but—it was just good to break out and try new things; to exercise different parts of my artistic brain. The piece in the photo above measures 9 x 12”. It’s ink, cold wax, oil pastel, and water color on clay board. The lines are engraved into the clay surface. It’s time consuming, but so satisfying. It also taught me about the value of spending even more time developing the surface of a composition. A few more of my workshop pieces appear below. Click any of the images to page through larger images in a gallery. They’re a mixture of works on paper, board, and yupo (a plastic “paper”) using a who range of media and technique. A major milestone: QUILT NATIONAL 2019! I have some exciting news to share. This week I reached what feels like a major milestone. One of my art quilts, “Outward Movement #1,” was accepted into Quilt National 2019. Quilt National is a biennial quilt show that attracts entries from all across the world. 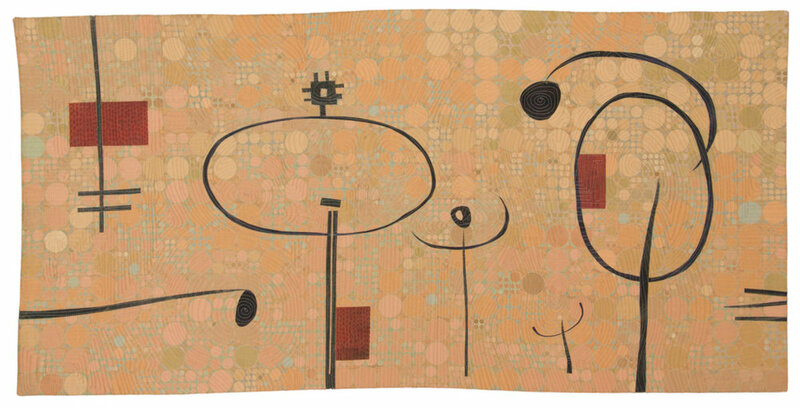 It’s among the top tier of art quilt shows, and it’s been a stretch goal of mine for several years. This is my first acceptance after a number of attempts. To say that I’m thrilled and honored is an understatement. Over the moon is a little more accurate. When I read the acceptance email I had one of those gasping/laughing/crying moments. Let this be a lesson not to read email at stop lights. I told a few people right away, but have been keeping this to myself for a couple of days, just letting it roll around in my head and heart while I remember the great teachers, mentors, and colleagues who’ve helped me learn and grow. Thank you all. You can see more images of the quilt and read more details in my portfolio. This quilt was created using the hybrid manual/digital techniques that I’ve been writing and talking about for the last couple of years. This is the second of two articles that deal with my ventures into digital fabric printing. The first article dealt with digital printing in the context of my larger journey and identity as a fiber artist. This time I want to discuss the different sorts of digitally printed cloth and the ways in which I’m using digital printing--ways that I believe are a bit different from what I’ve seen from other artists. Utilitarian: Banners or other signage that were once screen printed and are now produced on a digital printer. Yardage: Traditional repeat patterns of graphic elements, or an abstract, non-repeating pattern printed on cloth to produce yardage for garments, home dec items, etc. Faithfully rendered photographs: Think of a memory quilt that incorporates photos of your grandparents printed on fabric. Manipulated photographs: Colorized, filtered, and altered images typically printed with the intention of making art. Computational art: These are designs created entirely within a computer program specifically designed to create digital images. For example a program that creates fractal designs. Whole cloth compositions: A length of digitally printed cloth that is a finished product or a step along the way to creating a finished artwork. Subsequent steps might include dyeing, painting, stitching, cutting, etc. Created entirely in the computer through drawing, manipulating images, or using a computer program to create an image. 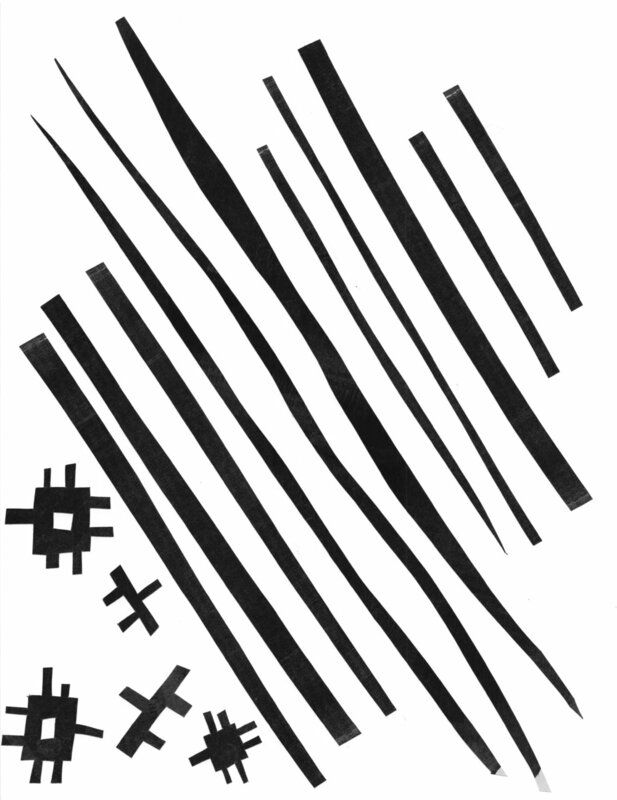 Created in a hybrid manual/digital space that involves creating a design on paper, scanning or photographing that work to get it into the computer, then manipulating the image further to create a result that is ready to print on fabric. With some trial and error I’ve settled into two work methods within the hybrid manual/digital approach, embracing some of the best of both paper and fabric. Specifically, I’ve found that the mark quality that I get from cutting paper with an X-ACTO knife is completely different from what I get when I cut fabric. The resulting compositions are different as well. It’s as if this way of working taps into a different part of my brain with its own distinct voice. These two methods both rely on digital fabric printing technology--wide carriage inkjet printing on fabric (I’ve been using spoonflower.com). I’m calling them “Digital design using hand cut elements” and “Paper compositions rendered on fabric”. There are pros and cons to each. The goal of this approach is to use cut paper to create marks, shapes, and motifs that can be scanned into the computer, and then used to create a composition on a background. Here’s how I do this. Paint black paper. Depending on your intended design you can create a very dense black or something with more visual texture and brush strokes. Alternatively you can use black construction paper, but I prefer the visual and physical texture of the paper I paint myself. I use a variety of papers including old newspaper, receipts, found bits of paper, and Bienfang Graphics 360 marker pad. Cut shapes and linear elements. The goal is to build a vocabulary of curved and straight lines, both thin and thick, as well as a variety of shapes. Glue the shapes and lines to white card stock. Uhu glue stick is my preferred adhesive. You’re not trying to create a composition, just get them on the page without overlapping. Scan or photograph the resulting pages, then store the originals someplace flat, dry, and safe so that you can return to them in the future if necessary. I use sheet protectors in a loose leaf binder. Open the image file(s) in a graphic editing program (e.g., Adobe Photoshop or Illustrator). From here you can select and copy your individual shapes then scale, stretch, rotate, flip, and colorize them to meet your needs. The reason for creating these shapes in black is so that they can be easily selected, then black can be replaced with other colors. Build your composition in a separate file by copying and pasting your shapes and lines onto a background of your choice. When the design is finished, upload it to an online printing service or take the file to an appropriate local print shop for output on fabric. Because all of the elements exist as separate objects in your digital design, you can easily move them around until the composition is to your liking. You can also create an unlimited number of variations. The computer is a wonderful tool, but I find that sometimes the technology can be a little cold and detached, creating a separation between the artist and the work. I don’t get the same feeling from this process that I do when I’m working exclusively on paper. Paint paper in a variety of colors (a full range of hues and values; don’t forget the neutrals). Prepare a painted background on card stock. Cut the shapes from your colored paper required to create a composition. Arrange the shapes, lines, etc. on the painted background. Add other drawn or printed elements to the composition if appropriate. Glue the shapes and lines in place on the background. Scan or photograph the resulting composition, then store the original someplace flat, dry, and safe. As noted above, I’ve been storing my work in sheet protectors in a binder. Open the image file in an image editing program (e.g., Adobe Photoshop) and do whatever retouching, adjustments, or color correction is necessary. Crop or scale the image as needed. When the design is finished, upload it to an online printing service for output on fabric. For me, the final, optional step is often to layer the printed fabric with batting and backing, then add dense quilting that speaks to the printed design. I often incorporate hand stitch as well. The design work is completely analog. The computer is only used as a means of getting the resulting composition printed on cloth. Working this way keeps me slow and focused and avoids those times when I get lost in trying to figure out how to do something using Photoshop that I can easily do by hand. To my way of thinking there aren’t many cons to this method, except for the one that’s inherent in all works of the hand. Unlike the digital design method described above, when you cut something it’s cut; when you make a mark it’s made. There aren’t too many easy undos, but isn’t that part of the fun? There are several technical considerations to bear in mind when using either of these hybrid manual/digital methods, particularly if you are using the second approach to prepare an entire composition on paper for later printing on cloth. Understand the relationship between the image resolution from your camera or scanner and the final resolution required for printing on cloth. Some manipulation of the resolution will be required and you need to consider the resolution requirement of the printer. Regardless of image resolution, if your final printed cloth is larger than your original paper composition, then you are scaling up. That scale change means that you need to plan for your design elements to be enlarged or you need to work on larger paper. Those delicate marks on your paper design can become a lot less elegant at 400%. If possible and practical, use a flatbed scanner to create an image of your paper composition. You might still need to do some color adjustments, but your work will be held perfectly flat, lit evenly, and imaged at a high resolution. If your work is too large to scan (e.g., larger than 8.5” x 11” or 8.5” x 14”), then you can either scan it in sections or photograph it. Scanning in sections requires planning up front. For example, will you build your design across several sheets of paper or will you work on one large sheet and cut it into smaller pieces for scanning? Ultimately, these individual images will need to be combined to form a single seamless image. If you’re photographing your composition because you don’t have access to a scanner or don’t want to cut up a piece that’s too large to scan, then it’s important to photograph the piece as flat as possible, light it evenly, fill the camera’s viewfinder as completely as possible to maximize resolution, and make certain that your camera is square to the plane of the artwork (i.e., not tilted, twisted, or angled). Use a tripod and focus carefully to insure that the image is as sharp as possible. To get the color from your printer that you want on your final cloth you’re going to need to pay close attention to color throughout the process. That likely means color correcting what you’re getting out of your camera or scanner, working on a color corrected monitor, and accounting for the color profile of the printer that will be used to create your fabric. Alternatively, you can just not stress over color and accept what you get back from the printer. Finally, if you incorporate painted newsprint or any other paper with visible writing on it into your composition, realize that even if the text is upside down and backwards the viewer will try to read it and assign meaning to it. Be intentional in your use of text and pay close attention to the amount of text that is visible on your painted paper. This is the first of two articles that deal with my sojourn into digital fabric printing--the why and how of it and what it means in the context of my larger journey as a fiber artist. We’ll start with the big issues in this article. I’ll dig into the methods in the next one. I’ve been dyeing and printing fabric for close to 20 years, and I still find it exciting. I love the process of getting color onto and off of cloth. I love the details--the measuring, weighing, and calculation--that allow me to create predictable, repeatable color. I love the toolmaking--carving relief printing blocks, designing and burning silk screens, and gathering found objects that become mark making implements. I love painting and printing big pieces of cloth. And then, of course, there are all of the things that happen to that printed cloth. It becomes art cloth for the wall, it gets quilted or stitched, or it becomes art to wear--one of a kind scarves or jackets. Lately though, I’ve been wrestling with a guilty feeling that I’ve been disloyal to my craft, or at the very least veering off on a tangent. In all of my time as a dyer, I’ve been a quilt surface designer. I’ve made pieced quilts as well as quilted whole cloth paintings. But, for the last year or so, the thing that’s excited me the most is cut paper collage. 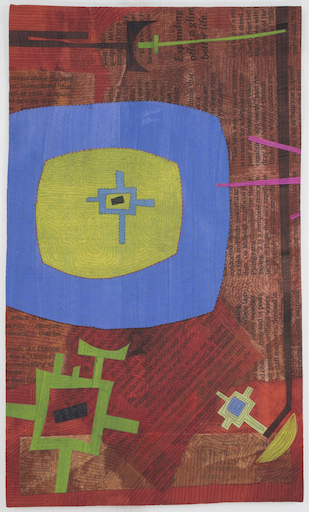 I paint paper--drawing paper, found bits of paper, old newspapers--with gouache in an array of colors, then cut it into shapes and arrange them to form a composition. This method is anything but new. Many artists have worked in collage, Matisse being not the least among them (try Googling “Matisse collage”). To give credit where it’s due, I started getting excited about collage through workshops on color theory, collage, and design that I’ve taken with David Hornung. Collage takes many forms: combinations of found images and/or text, combinations of solid color shapes, figurative, abstract, the whole gamut. 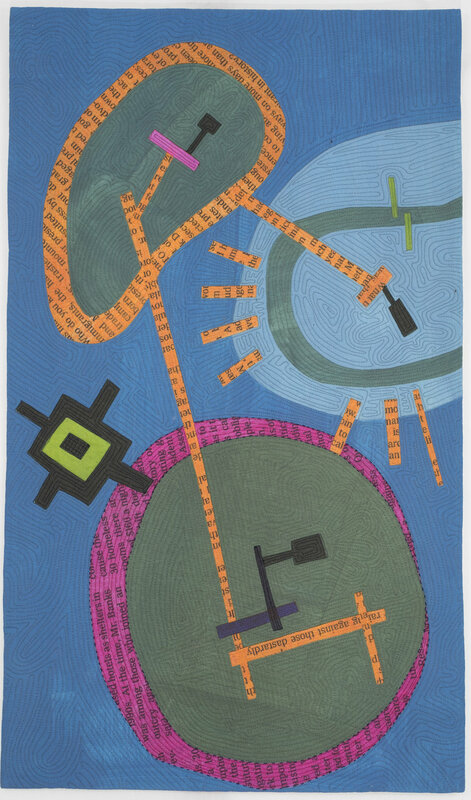 You might say that the term “collage” is a big umbrella term that covers lots of forms of “sticking stuff to paper”. For me, there’s something totally different that happens in my brain when I’m cutting, arranging, and layering paper compared to cutting and piecing fabric, or even painting directly on fabric. Designs and motifs emerge when I cut into paper with an X-ACTO knife that are completely different from what happens on my design wall with fabric. But I still want to work in fabric, and I want to incorporate the textural layer of quilting into the final composition. With some trial and error I’ve found my way to two work methods that embrace some of the best of both paper and fabric. They both rely on digital fabric printing technology--wide carriage inkjet printing on fabric. I create shapes or full designs on paper, scan or photograph them, then send them to a service provider for printing on cloth. When I receive the printed cloth I can them treat it as finished art cloth or add more layers to it through paint, stitch, quilting, etc. Detailed discussion of these methods will be the subject of the next article in this series. For now it’s enough to know that I’m allowing a computer to put dye/pigment on cloth, rather than doing it with my own two hands. So, what’s all this hand wringing about “surface design guilt”? Well, it comes down to the simple facts of change and that newest of buzzwords, disruption. I’ve spent years building knowledge, skill, and experience in the manual work of hand dyeing and printing cloth. Now I find that I’m able to create a finished work of fiber art without ever touching dye or fabric paint, and it makes me a little uneasy. It sometimes feels inauthentic. 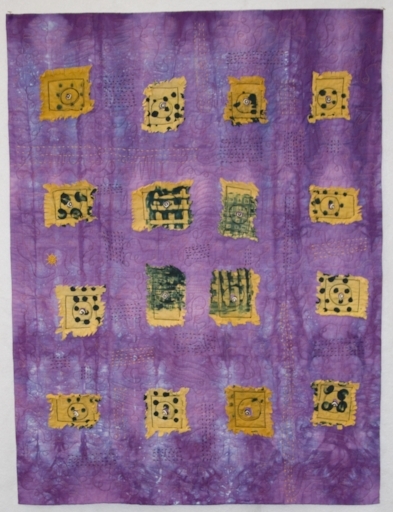 Heretofore, part of the challenge--the foundational craft in this particular art form--has been the skillful manipulation of dye, paint, and cloth to produce the desired result. The computer and printer certainly bring their own set of challenges, but those aren’t generally surmounted using the skills I’ve worked so hard to learn. In the end, the peace that I’ve made with all of this is perhaps the same peace that others have made. As artists we must embrace new opportunities, tools, and ways of thinking, while remaining grounded in those traditional and foundational skills. Perhaps a fitting comparison might be that a artists using a knitting machine is probably better able to make effective use of that tool if they first learn to knit by hand. I also wonder about the future. I hope that young artists will continue to learn about traditional, manual ways of working before making the leap of digital tools. I have no desire or intention to stop working with dye, because that particular set of tools and techniques produces different results for me than digital tools. However, it’s also interesting to consider that at some point in the future I might live someplace different and might not find it practical or even desirable to have a full fledged dye studio. The new processes I’ve been exploring lend themselves to a way of making art that requires not much more than a computer, internet connection, cutting table, and sewing machine. So, I suppose the “guilt” I’m feeling is mostly rooted in the idea that I simultaneously want to try new thing and be part of the change, and yet I don’t want to see things change too much. And, since we can’t have it both ways, I’m going to forge ahead with one foot on each side of the line between tradition and technology. In the next article in this series I’ll examine how that blended approach is influencing the way that I work. Let's all make some artistic plans for the weekend! Here's my suggestion. The event includes the quilt show, about a dozen vendors, a silent auction, and some wonderful raffle items, including an award-winning quilt. It's well worth the $10 admission. Hope to see you there. Mark your calendars. 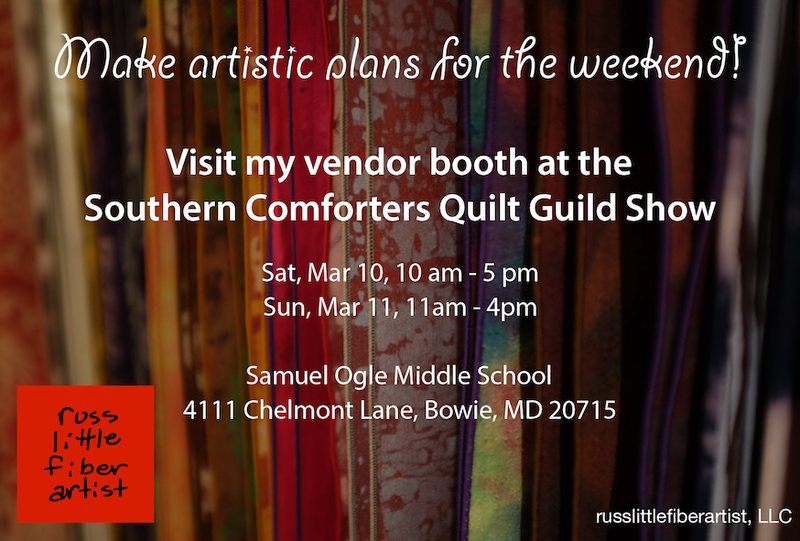 I'll be selling wearable art scarves at my booth at the annual Southern Comforters Quilt Guild show next weekend, March 10-11, in Bowie, MD (Samuel Ogle Middle School, 4111 Chelmont Lane). The event includes the quilt show, about a dozen vendors, a silent auction, and some wonderful raffle items, including the award-winning quilt pictured above. It's well worth the $10 admission. It's also a manageable sized show. You can probably do the whole thing (including shopping!) in an hour, making it a nice weekend afternoon activity. The Guild is a great organization that supports quilters and provides educational and service outreach to the community. Come out and see my latest wearable work and support the Guild. The year is getting off to a brisk start. I've been so busy in the studio that I've neglected to share some really exciting news (or at least there's nothing about it on the website yet, so I'm thinking that I haven't shared it). 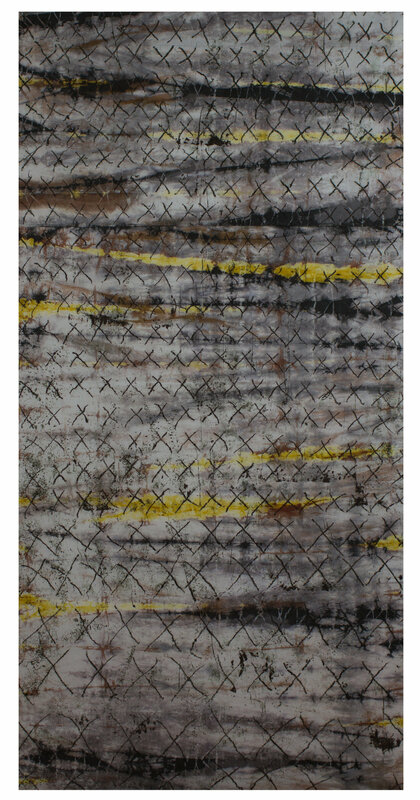 In early December I learned that I had 2 pieces juried into the new Art Cloth Network show titled, "Unbound". The juror was Michael James from the University of Nebraska - Lincoln. I'm really delighted to have had my work in front of someone with his reputation, and even more delighted to be selected to be part of what I think is a strong show. While the body of work has been selected, the first exhibit venue hasn't yet been secured. However, the exhibit catalog has been published on Blurb. It's beautiful--thanks to Barbara Schneider--and one of my pieces was used for the cover. I'm giggly-thrilled. Check out the image above. You can see my two accepted pieces by clicking the links to my portfolio below. Both works are part of a series I started last year based on cut paper collages that have been enlarged, printed on fabric, and quilted. I love where this is going, and it will be my focus for the year, if/when I can take a break from dyeing cloth to replenish my depleted inventory of wearable items. Spring shows are right around the corner! All of a sudden the holidays are upon us. As you contemplate gifts for friends, family, and self, please consider supporting the local craftspeople and artists who will be at this year's Greenbelt Festival of Lights Juried Art & Craft Fair. It's a wonder show in a community that really supports the arts. The event runs Saturday Dec 2 (10-5) - Sunday, Dec 3 (10-4) at the Greenbelt Community Center (directions). I'll have a booth again this year, selling wearable art. I hope to see you all there. Earlier this week I dropped of new art quilts at Peg Leg Vintage in College Park. It's just about the coolest local source for mid-century furnishing, accessories, and consigned art. If you're in the DC metro area, then you definitely need to check it out. They recently got some excellent press in the Washington Post. In fact, when I was there the other day there were customers in the store who said that they came because of the Post article. Pretty great. You can find the story at https://www.washingtonpost.com/lifestyle/magazine/at-this-vintage-store-in-college-park-md-the-past-is-always-fresh/2017/11/07/7cffd834-b366-11e7-9e58-e6288544af98_story.html?utm_term=.42c0a0f2567b. Also look for them on Facebook (https://www.facebook.com/PegLegVintage) and follow their weekly posts of newly arrived items. I think that my new work is going to be featured this coming week. Check out the newest items in my online store--the fruits of an intense month of dyeing! I'm delighted to say that my ongoing relationship with Peg Leg Vintage in College Park is proving to be both pleasant and rewarding. Their super-cool midcentury vibe fits perfectly with my own aesthetic, and their enthusiasm and support for my work is just great. The piece above, "Emerge" is an older work from 2009 that just sold last month! They've also carrying smaller framed works. Now, if could just stop buying furniture perhaps I could make a genuine profit! You can read more about "Emerge" in the portfolio section. "Nuclear Family," exhibited at the Schweinfurth Art Center in the summer of 2016. Forget the super moon. The big thing now looming large on the horizon is the end of 2016, a year that will, for a host of reasons, be remembered, analyzed, and discussed ad nauseam for years to come. From a more personal perspective, this year has been one of significant change: leaving a job I loved (not entirely by choice), working independently in a new field, and learning a bit more about the kind of work that I like doing. At the very top of the list: Be careful what you wish for. I've long said that I'd love to try working as a full-time artist. This year I've had the great good fortune to have been given just that opportunity, but it's sort of like the universe called my bluff. Working alone, even for an introvert, can get lonely. It's really important to build social and professional connections and to interact with people. I miss the daily collegial conversations that naturally come as part of a corporate job. I know that this is something that I need to attend to in the coming year. I miss the leading, teaching, and helping aspects of my former career. I expect that most any artist would say that there's a delicate balance between working studio time, quiet thinking time, and other pursuits. I'm looking for ways to scratch the itch for teaching and leading, but still guard that precious studio time. I'm still trying to figure it out what it means to be a “working artist.” In western culture in particular, work equates to a JOB (i.e., nothing that could ever be misconstrued as a hobby), progressive responsibility, earned income, financial independence, etc. Very few artists produce artwork that fits this description. Fame and fortune are not the objectives, and if they come at all, it's only after years of hard work—or after you're dead. This year I've been fortunate to have had my income supplemented by severance pay from my last job. That being said, I also sold enough work to be in the black for the year, but you can hardly call my net earning a living wage. I have artist friends who make money by teaching, publishing books, and doing TV appearances. Although I'm interested in teaching, I don't see myself becoming a traveling teacher or doing super-sized craft shows all over the country. Now I've got to figure out where that leaves me. I also know that, lofty as it might sound, one of my top priorities has to be growing as an artist and producing the best work of which I'm capable. Again, I have the great good fortune that Dan and I have arranged our finances in a way that allows me to continue on this journey next year. Finally, although it should be obvious, I've had to remind myself more times than I can count that changing careers is starting over—going back to the bottom and working your way up again. You don't get to step out of a mid-career, peak earning job into a similar situation in a completely different field with a different pay structure and expect all things to remain the same. Again, obvious. Knew it before I started. Still need to remind myself not to compare apples and oranges. Now, I have to say that writing those five bullet points has put me in a bit of funk. What am I doing? Is this all a mistake? But I know that this just another aspect of being your own boss. I don't have a boss to give me a good yearend review, and no teammates to offer positive feedback. Depending on your personality, when you work alone, it can be easy to lose sight of your accomplishments when you're focused on big questions and the future. So, for the record, I am proud of what I've accomplished this year--more sales, more commissions, more inventory, and more artwork being exhibited out in the world. I aimed high and applied for some very selective art competitions and craft shows, but didn't get accepted to most. Hey, aim high, fall far, get up and try again. To be honest, not getting into a huge, 4-day, very expensive craft show is not the worst thing that could happen! So, here's my closing thought: 2016 has been a real adventure, full of learning and growth, and I can't recall ever uttering the words, “I'm bored.” I'm looking forward to more of the same in 2017. And to all of you who congratulated me on my “early retirement,” please know that I appreciate the good wishes, but I'll be continuing in my not-so-secret identity as the Owner and Principal Artist at russlittlefiberartist, LLC for the foreseeable future. I'll figure out the retirement thing when I get there. Hey folks, if you find yourself in the Bay Area between now and Jan 15, 2017 consider a trip to the San Jose Museum of Quilts and Textiles to see the Art Cloth Network show titled, "Anything Goes." This is our second exhibit at the museum, and we're delighted to have an opportunity to show our work in such a distinguished venue for fiber. I'm delighted to have my piece "Focal Point" included. I'm happy to say that we had another great year at the Greenbelt Festival of Lights Juried Art & Craft Fair. I got to reconnect with many of my longstanding local customers and supporters, meet many new folks, and enjoy the company of some outstanding fellow craftspeople. This is a really wonderful event. It always happens the first weekend in December. Pencil it in on your 2017 calendar now. If you couldn't make it this year, but still need that unique gift for a special someone, please check out the growing list of new items in my online store. The last day for shipping pre-Christmas orders is December 20. Click the links below each photo to see more images. I've currently got a piece of art cloth hanging in an Art Cloth Network show at the Historic Dole Mansion in the Lakeside Art Park in Crystal Lake, Illinois (NW of Chicago). The show runs through Aug 25th. Stop by and have a look if your summer travels take you to Chicagoland. Here's a photo of my work in the gallery. I confess that it's always a little bit of a thrill to see a piece hanging in a show. Here are images from the postcard for the First Friday opening reception. The face of the card features the work of Priscilla Smith. Special thanks to ACN member Barbara Schneider who got us this venue, installed the show, and gave the gallery talk at the opening.